It’s not just Borrelia burgdorferi causing Lyme Disease anymore. A new bacterium (still carried by ticks) has been found in the Upper Midwest that causes the painful condition. Borrelia mayonii, the new bacteria, isn’t actually new, just newly discovered. It is expected to explain undiagnosed illnesses in the Midwest. What’s different? You might already be familiar with Lyme Disease—after all, it’s spreading into the Midwest, too. Lyme Disease symptoms include the infamous bulls-eye rash, fatigue, and flu-like symptoms, Left untreated, chronic inflammation can cause long-term damage in joints and organs. 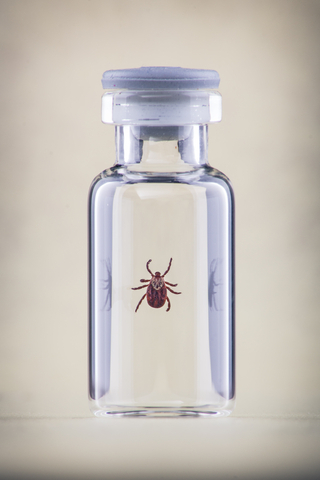 Symptoms of the newly identified Lyme Disease include a more diffuse rash at the tick bite site, rather than a bulls-eye, and includes nausea and vomiting. Lyme Disease is important to be aware of and spread awareness about, especially as it spreads and new strains like this one are discovered. Because Lyme Disease symptoms are so general (and the new version even more so without the clear-as-day bulls-eye rash) it can be hard to get a diagnosis early and accurately, increasing the risk of long-term Lyme Disease symptoms. As with most diseases, a stronger immune system does better than a weaker one. Make sure you’re supporting your immune system with colloidal silver! And keep yourself tick-free. Long pants and sleeves while hiking, and a tick check for you and your pets when you get back in—everytime. If you find a tick, save it after removing it and bring it in to your doctor or vet. (Pets can bring disease bearing ticks into your house, and can even get Lyme Disease themselves! Get listless pets a check at the vet. ).